Hikashu will perform two gigs in Hokkaido next month. Fukushima-cho on July 4 and Sapporo on July 5. According to the band, this is the first time for them to play the northern island in the 22 years. The 8th Jazz Art Sengawa, one of the most prominent events for improvised and creative music in Japan, is held on September 9 and 10 this year. 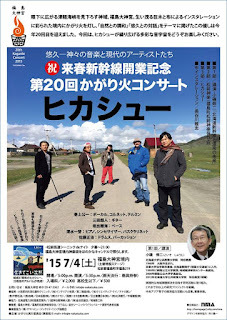 The venue is Sengawa Theatre which is located in Chofu of west Tokyo. 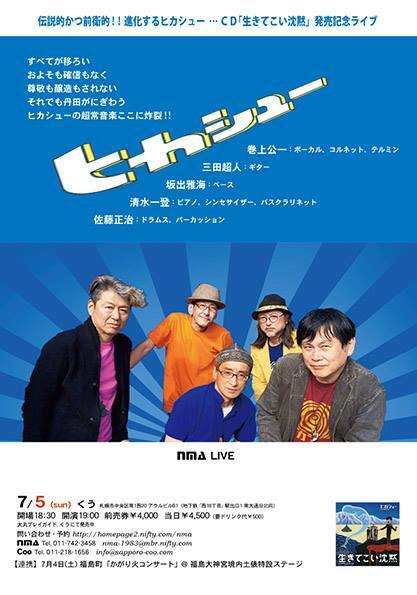 Jazz Art Sengawa is an artist-led event and its producers are Makigami Koichi (voice performer, multi-instrumentalist), Fujiwara Kiyoto (double-bass player and music educator), and Sakamoto Hiromichi (cellist and improviser). The line-up is as follows. Tickets available at the box office of the venue on June 27, 2015.